While the primary focus of the Interventional program is development of expertise in the clinical practice of interventional cardiology, Fellows are encouraged and expected to participate in scholarly pursuits during their Interventional Cardiology training. Potential projects may include the design and implementation of smaller scale clinical trials, participation in a database-centered research, development of a quality assurance project, and/or writing of clinical case reports. 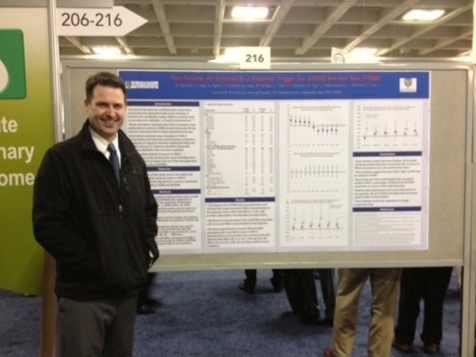 Many of our Fellows have also presented unique or challenging cases at national meetings. Narins CR, Krishnamoorthy V. Endovascular Approaches to Hypertension Management: Renal Artery Denervation and Carotid Sinus Modification, in Color Atlas on Interventional Cardiology. R Baliga and S Lilly editors. McGraw Hill, in press. Narins CR. Preoperative Coronary Intervention, in Textbook of Interventional Cardiology, 7th edition. EJ Topol and PS Teirstein editors; (Chapter 7); Elsevier, 2016. Alkhouli M, Narins, CR, Lehoux J, Knight PA, Waits B, Ling FS. Percutaneous Decompression of the Left Ventricle in Cardiogenic Shock Patients on Venoarterial Extracorporeal Membrane Oxygenation. Journal of Cardiac Surgery 2016; 31:177-182. Alkhouli M, Morad M, Narins CR, Bashir R. Inferior Vena Cava Thrombosis. Journal of The American College of Cardiology: Cardiovascular Interventions 2016;9:629-643. Narins CR, Lee J, Cole M, Ling FS. Pneumopericardium Following Pericardiocentesis. American Journal of Medicine 2016;129:e181-e182. Alkhouli M, Porter J, Waits B, Ling FS, Narins CR. Distal Embolization during Percutaneous Subclavian Artery Intervention. Vascular and Endovascular Surgery 2016; 50:175-179. Alkhouli M, Narins CR, Ling FS. Multidisciplinary Training in Cardiovascular Fellowship Programs. International Journal of Cardiology 2015;198:34-35. Tchantchaleishvili V; Becerra-Gonzales V; Fernandez G; Mieszczanska HZ; Jahromi BS; Cove CJ. Embolization of cardiac arteriovenous malformation with onyx. JACC: Cardiovascular Interventions. 2015;8:e39-40. Alkhouli M; Waits B; Chaturvedi A; Ling FS. Percutaneous Closure of Right Ventricular Pseudoaneurysm. JACC: Cardiovascular Interventions. 2015;8:e147-8. Tchantchaleishvili V; Melvin AL; Ling FS; Knight PA. Late erosion of Amplatzer septal occluder device resulting in cardiac tamponade. Interactive Cardiovascular & Thoracic Surgery. 2014;19:1074-6. Ling FS; Massey HT. Traumatic ventricular septal defect and flail tricuspid valve: successful management by an extracorporeal membrane oxygenator-supported hybrid approach. Catheterization & Cardiovascular Interventions. 2014;83:655-60. Reeves ER, Jahromi BS, Ling FS .Coil embolization of a coronary artery to left ventricular fistula using detachable coils. Catheter Cardiovasc Interv 2013;82:155-8. Gardner B, Rich RQ, Kulandhaisamy S, Topf M, Thevenet-Morisson K, Kane C, Frampton M, Zareba W, Utell M, Ling F. Fine Particle Air Pollution is a Potential Trigger for STEMI but not NSTEMI. J Am Coll Cardiol 2013;61suppl. Qian F, Hannan EL, Glance LG, Phelps CE, Ling FS, Veazie PJ. Coronary stent use in New York State in the drug-eluting stent era. J Eval Clin Pract 2012;18:872-7. Lal BK. Beach KW. Roubin GS. Lutsep HL. Moore WS. Malas MB. Chiu D. Gonzales NR. Burke JL. Rinaldi M. Elmore JR. Weaver FA. Narins CR. Foster M. Hodgson KJ. Shepard AD. Meschia JF. Bergelin RO. Voeks JH. Howard G. Brott TG. Restenosis after carotid artery stenting and endarterectomy: a secondary analysis of CREST, a randomised controlled trial. Lancet Neurology 2012;11:755-63. Narins CR. Restenosis and Percutaneous Options, in 1001 Questions: An Interventional Cardiology Board Review. D Mukherjee, L Cho, and DJ Moliterno editors; Lippincott-Williams and Wilkins, 2012. Blackshear JL. Cutlip DE. Roubin GS. Hill MD. Leimgruber PP. Begg RJ. Cohen DJ. Eidt JF. Narins CR. Prineas RJ. Glasser SP. Voeks JH. Brott TG. Myocardial infarction after carotid stenting and endarterectomy: results from the carotid revascularization endarterectomy versus stenting trial. Circulation 2011;123:2571-8. Cove C. Radial artery cardiac catheterization: changing the convincing data/work to change (CD/WC) ratio. Cardiol J. 2009;16:297-9. Narins CR. Access strategies for peripheral arterial intervention. Cardiology J. 2009:16;88-97. Nguyen N. Hasan S. Caufield L. Ling FS. Narins CR. Randomized controlled trial of topical hemostasis pad use for achieving vascular hemostasis following percutaneous coronary intervention. Catheter Cardiovasc Interv 2007;69:801-7.